With a storied history that includes feats, such as an NCAA Final Four appearance and an undefeated football season led by eventual NFL players, a new collaboration between the New Mexico State University Athletics Department and NMSU Library is preserving that history. NMSU alumni, former coaches and Aggie fans will have access to an abundance of materials soon. NMSU Athletics Director Mario Moccia and NMSU Library Dean Elizabeth Titus spearheaded the effort to create the Aggie Sports Archives. While the NMSU Library has collected materials from the Athletics Department for several decades, in early 2017, the University Archives staff began to assess a large collection of records from Athletics Department storage and transfer the appropriate records to the University Archives to ensure their long-term preservation, Daily says. About 250 linear feet worth of materials including important historical information, such as former players, coaches and staff files along with game statistics, programs, media guides, press releases, news clippings and tens of thousands of photographs, were collected from storage. The goal is to complete the preservation processing during the fall semester and to begin digitizing the collection later this academic year for public access. 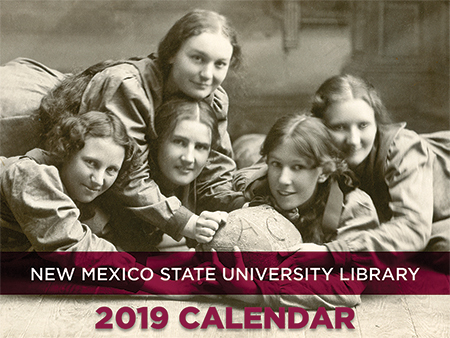 While supplies last, the 2019 NMSU Library calendar is available. The calendar illustrates the traditions of NMSU athletics with photos of the past and present. To order a calendar, email aerica@nmsu.edu or call 575-646-1508.